Corey Haim was 38. He was the Toronto actor who starred in such films as "Lucas", "The Lost Boys" and "License to Drive". Locals will remember him as Larry on "The Edison Twins" before he shot to fame in the mid-to-late 80s. Growing up in this city, it seemed like everyone had a Corey Haim connection. Every one of us was two degrees of separation from him or closer, and we all heard the stories. 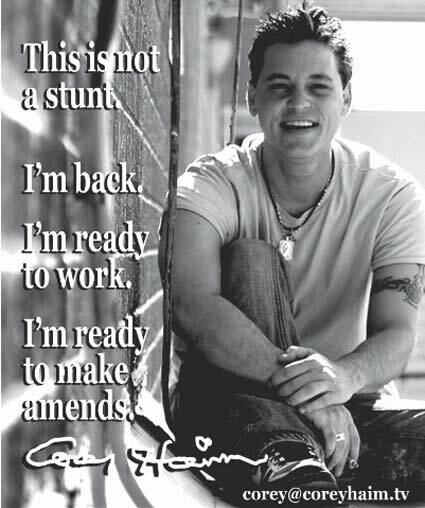 Here's a little something I wrote about Corey Haim back in 2006. To Corey's friends and family in this city, I'm deeply sorry for your loss. I always liked the guy and rooted for him to slay his demons. I liked the dude, I thought the show the two Corey's was great.He was the one everybody wanted to see.Drugs sometimes just get a hold of you. I'm gonna miss him. Lucas is one of my fav 80s movies. Drugs take another victim. Wasted lives are just that. I'm watching Stand By Me tonight to remember the dude. Another Hollyweird suicide. Its really becoming such a cliche. I am sad to hear another young person from the acting business has passed away. I cannot even understand anyones comments " big deal". It is a big deal for his family, friends and the industry. Anyones death is a big deal to the people that loved him, helped him and people who admired him as an actor. It is also a big deal his passing as a Canadian who made it in the USA. He was a frontier of Canadian actors to work in the USA and made it. His movies entertained many and will continue to entertain movie watchers. Being in the industry for over 30 years, I appreciate his struggles and the paths he took to open up doors in acting for other young aspiring Canadians. He should be admired and also a heart felt sympathy, that he struggled with stardom and the loss of. My deepest sympathy goes out to his family and friends. It is a sad day when we have a loss and such a wonderful talented Canadian actor. Words really cannot express. Who cares. I didn't even know who this guy was. Just another one of those teenage actors we all forgot.